کشورهایی که امنیت سرمایه‌گذاری بالایی دارند، می‌توانند از مزایای تجهیز پس‌اندازها برای سرمایه‌گذاری در فعالیت‌های تولیدی بیشتر بهره‌مند شوند. به دلیل اینکه بهبود امنیت سرمایه‌گذاری منجر به تمایل بیشتر پس‌اندازکنندگان برای مشارکت در بازار سهام می‌گردد. همچنین امنیت سرمایه‌گذاری نقش تعیین‌کننده‌ای در فرآیند تجهیز پس‌اندازها به سوی فعالیت‌های تولیدی از طریق بازار سرمایه و به ویژه تحریک پس‌اندازکنندگان به سرمایه‌گذاری در بازار سهام دارد. از این رو، هدف مطالعه حاضر بررسی تأثیر امنیت سرمایه‌گذاری بر تجهیز منابع مالی بازار سرمایه ایران با استفاده از داده‌های فصلی طی دوره زمانی 1372-1392 است. نتایج مطالعه نشان می‌دهد امنیت سرمایه‌گذاری تأثیر مثبت و معناداری بر تجهیز منابع مالی در بازار سرمایه دارد. همچنین متغیرهای توسعه بازار سهام، اختلاف بازدهی بازار سهام نسبت به بازارهای رقیب و و نرخ پس‌انداز تأثیر مثبت و معناداری بر تجهیز منابع مالی در بازار سرمایه دارند، در حالی که توسعه بخش بانکی تأثیر منفی و معناداری بر تجهیز منابع مالی در بازار سرمایه دارند. The countries that have a high investment security can better mobilize savings in production projects. High investment security leads to participation of many savers in stock market. Also investment security is a determinant factor in mobilization of savings through capital market for financing economic activities. Thus, the present study investigates the effect of investment security on mobilization of financial resources by using the quarterly data during 1992-2012. Results of research show that the investment security has a positive and significant effect on mobilization of financial resources in capital market. Also, other variables like stock market development, saving rate and the difference of return on stock with return of competitor markets have positive and significant effect on mobilization of financial resources, while banking sector development has negative and significant effect on mobilization of financial resources in capital market. ابزری، مهدی؛ صمدی، سعید؛ تیموری، هادی؛ «بررسی عوامل مؤثر بر ریسک و بازده سرمایه‌گذاری در محصولات مالی»، مجله روند، سال هفدهم، 1387، شماره 54 و 55. آل عمران، رویا؛ آل‌عمران، سید علی؛ (1392). «اثرپذیری بازار سهام در نتیجۀ رشد نامنظم حجم نقدینگی، فصلنامه بورس اوراق بهادار»، 1392،سال ششم، شماره 22. برومند، شهزاد؛ «امنیت اقتصادی در ایران و چند کشور منتخب مطالعه تطبیقی»، تهران، مطالعات اقتصادی مرکز پژوهش‌های مجلس شورای اسلامی، 1387. ترابی، تقی؛ هومن، تقی؛ «اثرات متغیرهای کلان اقتصادی بر شاخص‌های بازده یبورس اوراق بهادارتهران»، فصلنامه مدل‌سازی اقتصادی، 1389، سال اول، شماره 1. جعفری صمیمی، احمد؛ اختیاری، شهرام؛ «تأثیر امنیت اقتصادی بر فرآیند رشد اقتصادی در کشورهای عضو کنفرانس اسلامی با تأکید بر ایران»، فصلنامه علوم اقتصادی، 1387، دوره 2، شماره 3. ختایی، محمود؛ «گسترش بازارهای مالی و رشد اقتصادی»، مجموعه مقالات هشتمین کنفرانس سیاست‌های پولی و ارزی، تهران، مؤسسه تحقیقات پولی و بانکی، 1387. خسروی، حسن؛ «آسیب‌شناسی نحوه ارائه اعتبارات بانکی، تهران»، مؤسسه تحقیقاتی تدبیر اقتصاد، 1386. دادگر، یداالله؛ نظری، روح‌االله؛ «ارزیابی شاخص‌های مالی در ایران، اولین کنفرانس بین‌المللی توسعه نظام تأمین مالی در ایران»، مرکز مطالعات تکنولوژی دانشگاه صنعتی شریف، 1388. رهبر، فرهاد؛ مظفری خامنه، فرشید؛ محمدی، شاپور؛ «موانع سرمایه‌گذاری و تأثیرآن بر رشداقتصادی در ایران»، تحقیقات اقتصادی، 1386، دوره 42، شماره 81. سعادت مهر، مسعود؛ «بررسی تأثیرامنیت بر سرمایه‌گذاری خصوصی در ایران»، فصلنامه پژوهش‌های رشد و توسعه اقتصادی، 1391، سال اول، شماره 2. عزتی، مرتضی و دهقان، محمد علی؛ امنیت اقتصادی در ایران، تهران: مطالعات اقتصادی مرکز پژوهش‌های مجلس شورای اسلامی، 1387. فتحی، سعید؛ صامتی، مجید؛ عسگرنژاد نوری، باقر؛ «تبیین توسعه ساختار بازار اوراق بهادار»، مطالعات مدیریت راهبردی، 1389، سال اول، شماره 3. کشاورز حداد، غلامرضا؛ مهدوی، امید؛ «آیا بازار سهام در اقتصاد ایران کانالی برای گذر سیاست پولی است؟»، مجله تحقیقات اقتصادی،1384، شماره 71. کیانی، رضا؛ اسکندری، حمید؛ عسگری فیروزجایی، احسان؛ «تأمین منابع مالی با رویکردی بر بازار اوراق بهادار»، مدیریت تحقیق و توسعه بورس اوراق بهادار تهران، 1393. گوگردچیان، احمد؛ فتحی، سعید؛ امیری، هادی؛ سعیدی ورنامخواستی، نسرین؛ «تحلیل مقایسه‌ای تأثیر ریسک سیاسی بر توسعه بازار سهام کشورهای منتخب»، 1394،سال چهارم، شماره 15. مجتهدی، احمد؛ کرمی، افشین؛ «ارزیابی متغیرهای مؤثر بر رفتار پس‌انداز ملی در اقتصاد ایران»، فصلنامه پژوهش‌نامه بازرگانی، 1382، سال هفتم، شماره ٢٧. میشکین، فردریک اس؛ اقتصاد پول، بانکداری و بازارهای مالیم، ترجمه و تالیف حسین قضاوی، تهران، جلد اول، مؤسسه عالی آموزش بانکداری ایران، 1388. Aduda, J., Masila, J. M. and Onsongo, E. N; 2012,"The Determinants of Stock Market Development: The Case for the Nairobi Stock Exchange",International Journal of Humanities and Social Science, Vol. 2, No. 9. Ang, J. B; 2007,"Are Saving and Investment Cointegrated? The Case of Malaysia (1965–2003)",Applied Economics, No. 39. Ang, J. B; 2011,"Savings Mobilization, Financial Development and Liberalization: The Case of Malaysia",Review of Income and Wealth, Vol. 57, No. 3. Ashfaque H. Khan. and Aynul Hasan, M; 1988, "Financial Repression, Financial Development and the Structure of Savings in Pakistan", Pakistan Development Review, Vol. 27, No. 4. Cherif, M. and Gazdar, K; 2010, "Institutional and Macroeconomic Determinants of Stock Market Development in Mena Region": New results from a panel data analysis, The International Journal of Banking and Finance, Vol. 7, No. 1. Demirguc-Kunt, A. and Levine, R; 1996a, "Stock Markets, Corporate Finance and Economic Growth: An Overview", The World Bank Economic Review, Vol. 10, No. 2. Demirguc-Kunt, A. and Levine, R; 1996b, "Stock Market Development And Financial Intermediaries: Stylized Facts", The World Bank Economic Review, Vol. 10, No. 2. Elser, L. L., Hannig, A. and Wisniwski, S; 1999, "Competitive Analysis of Savings Mobilisation Strategies", consultative group to assist the poorest (CGAP) Working Group on Savings Mobilisation, Eschborn. Fabricius, M; 1998, "The Impact of Economic Security on Bank Deposits and Investment", IMF Working Paper. Garcia, F. V. and Lin, L; 1999, "Macroeconomic determinants of stock market development", Journal of Applied Economics, Vol. 2, No. 1. Goldsmith, R. W; 1969, Financial Structure and Development, New Haven: Yale University Press. Gordon, T; 1967,"The Welfare Costs of Tariffs, Monopolies, and Theft", Western Economic Journal, Vol, 5, No. 3. Guha-Khasnobis, B. and Mavrotas, G; 2008a, "Financial Development, Institutions, Growth and Poverty Reduction", Palgrave Macmillan, New York. Guha-Khasnobis, B. and Mavrotas, G; 2008b, "Financial development, institutions, growth and poverty reduction", Palgrave Macmillan, New York. Gupta, K. L; 1984, "Finance and Economic Growth in Developing Countries", London: Croom Helm. Jun, Z., Hongzhong, Z., Thierry, B. and Yannick, G. Z. S; 2015, "Macroeconomic Determinants of Stock Market Development in Cameroon", International Journal of Scientific and Research Publications, Vol. 5, No. 1. Kemboi, J. K. and Tarus, D. K; 2012, "Macroeconomic Determinants of Stock Market Development In Emerging Markets: Evidence From Kenya", Research Journal of Finance and Accounting, Vol. 3, No. 5. 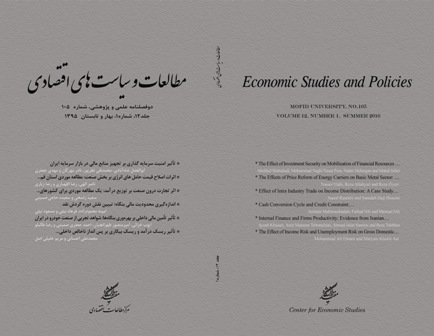 Khorshidi, H. A., Mokhatab Rafiei, F. and Hoseini, S. M; 2010, "Macroeconomic Determinants of Stock Marketdevelopment: Evidence of Iran", International Journal of Decision Science, Vol. 1, No. 2. King, R. G. and Levine, R; 1993a, "Finance and Growth: Schumpeter Might be Right", Quarterly Journal of Economics, Vol. 108, No. 3. King, R. G. and Levine, R; 1993b, “Finance, Entrepreneurship and Growth: Theory and Evidence”, Journal of Monetary Economics, Vol. 32, No. 3. La Porta, R., Lopez-de-Silanes, F. and Shelifer, A; 2002, "Government Ownership of Banks", The Journal of Finance, Vol. 57, No. 1. Laeven, L. and Majnoni, G; 2005, "Does Judicial Efficiency Lower The Cost of Credit? ", Journal of Banking and Finance, Vol. 29, No. 7. Levine, R; 1997,"Financial Development and Economic Growth: Views and Agenda”, Journal of Economic Literature, Vol. 35, No. 2. Levine, R. and Zervos, S; 1996, "Stock Market Development and Long-Run Growth", World Bank Economic Review, Vol. 10, No. 2. Levine, R. and Zervos, S; 1998, "Stock Markets, Banks, and Economic Growth", American Economic Review, Vol. 88, No. 3. Levine, R., Loayza, N. and Beck, T; 2000, "Financial Intermediation and Growth: Causality and Causes", Journal of Monetary Economics, Vol. 46, No. 1. Mavrotas, G; 2008, "Domestic Resource Mobilization and Financial Development: Introduction", In George Mavrotas (ed. ), Domestic Resource Mobilization and Financial Development, Palgrave Macmillan, New York. Mishkin, F; 2001, "Financial Policies and The Prevention of Financial Crises In Emerging Market Countries", NBER Working Paper 8087. Nacuer, S. B., Ghazouani, S. and Omran, M; 2007, "The Determinants of Stock Market Development in the Middle-Eastern and North African Region", Managerial Finance, Vol. 33, No. 7. Ngugi, R. W. and Njiru, R; 2005, "Growth of the Nairobi Stock Exchange Primary Market", Kenya Institute for Public Policy Research and Analysis (KIPPRA) Discussion Paper, Nairobi, No. 47. Poirson, H; 1998, "Economic Security, Private Investment and Growth in Developing Countries", IMF, WP/98/4. Shahbaz, M., Nadeem, A. and Liquat, A; 2008,"Stock market development and economic growth: ARDL causality in Pakistan", International Research Journal of Finance and Economies, No. 14. Vogel, R; 1984, "Savings Mobilization: The Forgotten Half of Rural Finance"in Undermining Rural Development with Cheap Credit, Adams, D., D. Graham and J.D. Von Pischke, eds., Westview Press. Yartey A.C; 2008, "The Determinants of Stock Market Development in Emerging Economies: Is South Africa Different? ", IMF Working Paper, WP/08/32. Yartey, C. A; 2004, "The economics of civil war in Sub-Saharan Africa, in Post Conflict Economics in Sub-Saharan Africa", (Ed.) J. Clement, International Monetary Fund, Washington. Yartey, C. A; 2010, "The Institutional and Macroeconomic Determinants of Stock Market Development in Emerging Economies", Applied Financial Economics, Vol. 20, No. 2. Yartey, C. A. and Adjasi, C. K; 2007, "Stock Market Development in Sub Saharan Africa: Critical Issues and Challenges", IMF Working Paper, WP/07/209.